One of the most interesting things to observe when one is walking aimlessly on streets and alleys is the expressions people offer. Take this photo for example. I took it about a month ago, it’s that small shop around the corner that sells candies, cigarettes, betel leaves and breath mints; they are very common in our city. Now, I am no queen of emotional intelligence, but it appears to me that the shopkeeper IS smiling, but that is not a smile of amusement. He is smiling, but there is contempt in his smile. What could bring such a smile on his face? Surely, it’s something the customer said. It could be a remark on politics and corruption- they are two very popular topics in our country. Or may be the customer just said something that he himself thought was funny, when, in fact, it was not. As most of the shops believe in “we can’t spell success without U” policy, the shopkeeper was just smiling to appear polite. What I thought was contempt was actually nothing but mere boredom. This kind of shops usually have a very loyal customer base and the shopkeepers develop a close relationship with these customers. 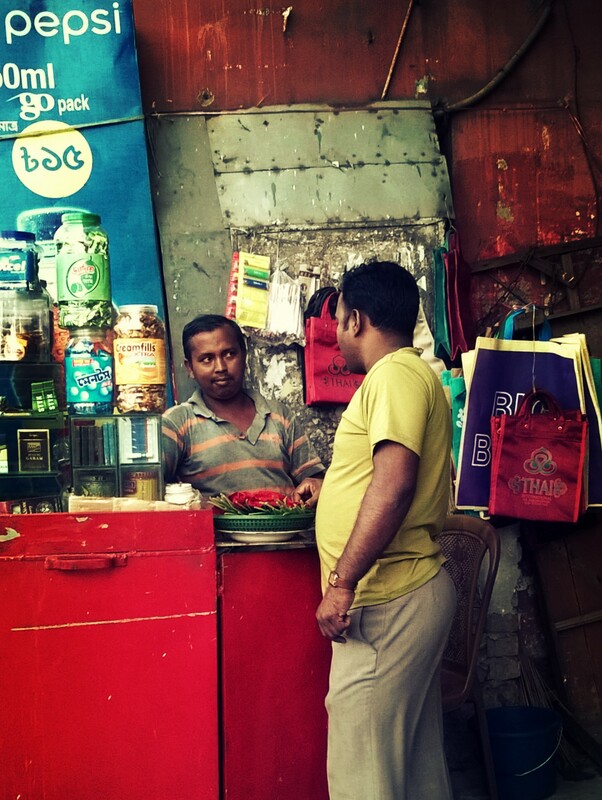 It may very well be that he buys half a dozen betel leaves everyday on his way home from his workplace for his old mother who lives with him. Maybe he doesn’t like the fact that his mother is dependent on these leaves, it takes a toll on her overall health, but he cannot make himself talk to his mother about it. His mother has led a very simple life, devoid of any kind of luxury. She has been a very devoted and loving mother, his son loves her as well and wants her to be happy. But as his job doesn’t pay much, this is as close as she gets to being luxurious. We might never know for sure why the shopkeeper was smiling like that. But there can be so many interpretations and every single interpretation opens up a new door to a new story. Why do you think he was smiling? Tell me on the comments! Have a great time interpreting expressions and making up stories! This entry was posted in #longreads, #shortreads, Fiction & Poetry, Photography, Short Story, Story, Writing/blogging and tagged Bangladesh, customer, Dhaka, expressions, fiction, how to start writing, interesting expressions, interpreting, shaily, shopkeeper, short story, story on June 15, 2015 by suzzeta. I 100% agree with you. I love your curiosity, and I feel where you’re coming from. Do you really think that that is a smile though? Say that you’re right, then ide say that they were discussing exactly what you assumed. Or maybe, what we cannot assume? Could they not maybe be speaking about something that we’re not familiar with? Something so foreign that we cannot comprehend the gesture of the shopkeeper? I must credit you for the photography. Well taken. That was a great interpretation! Yes, they could certainly talk about things so foreign that people like us cannot comprehend, unless we are regular at their hang outs!